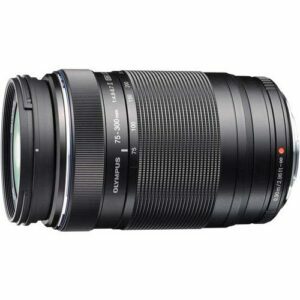 Lens Description: The newly designed M.ZUIKO DIGITAL ED 75-300mm II f4.8-6.7 with a 35 mm equivalent of 150-600mm is an affordable super telephoto lens that delivers excellent portability and outstanding image quality when paired with the award-winning Olympus PEN or OM cameras. Weighing only 14.9 ounces and measuring 2.7 by 4.58 inches and reaching 300mm, this is the perfect lens to take with you for capturing outdoor nature scenes. Comprised of 18 elements in 13 groups, including a Super ED lens provides exception optical performance throughout the zoom range. One Super ED (extra-low dispersion) lens and 2 ED lenses eliminate chromatic aberration which deteriorates a picture. 3 HR (high refractive index) lenses make the lens compact and provide an excellent picture throughout the zoom range.